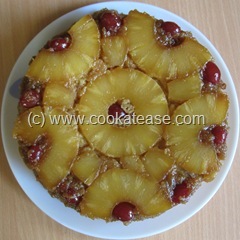 Pineapple gives a lovely aroma and nice taste in whichever dish you add. 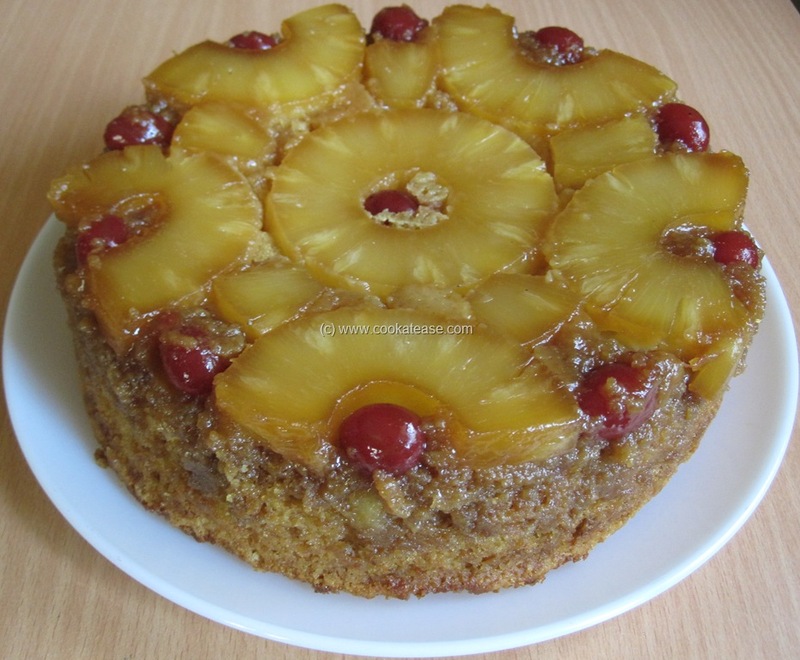 Eggless Pineapple Upside Down Cake is very attractive and it is my dream cake to bake. 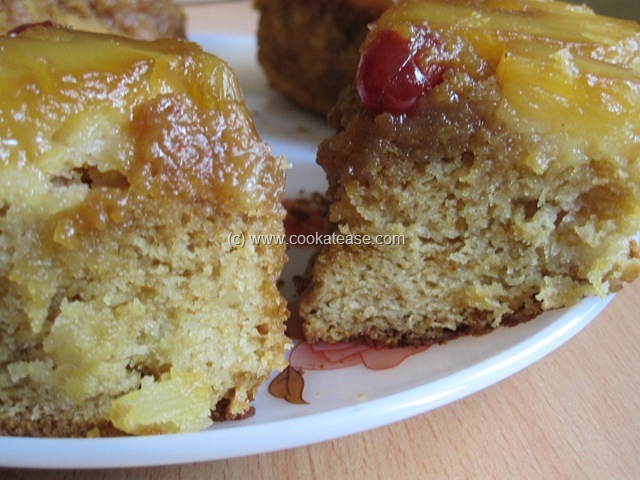 To bake this cake, I used tinned pineapple (as pineapple slices are neatly shaped), glazed cherry (to make more attractive cake), jaggery and butter. 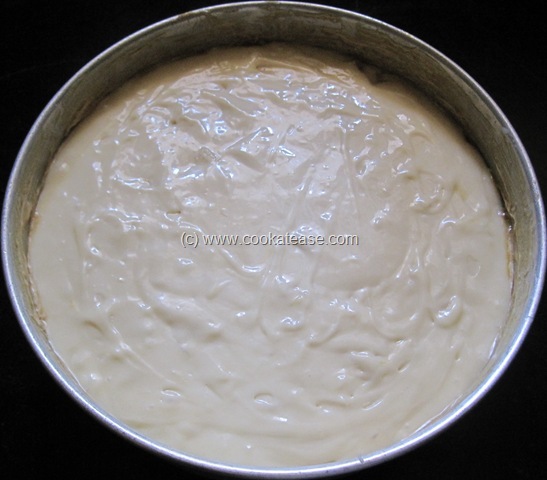 This cake uses eggless sponge cake recipe. 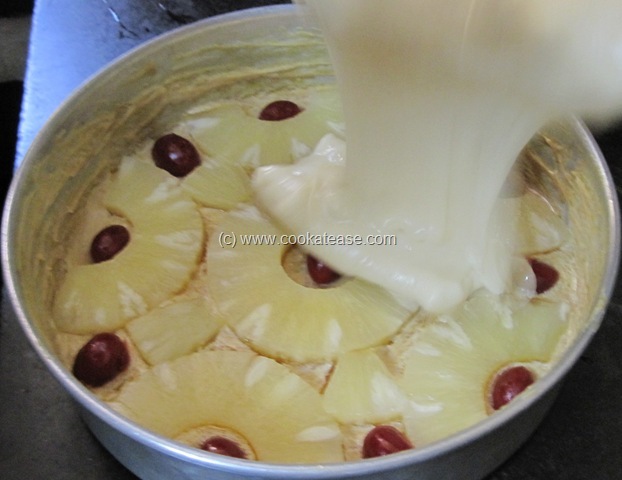 Pineapple is known as Annasi Pazham in Tamil. 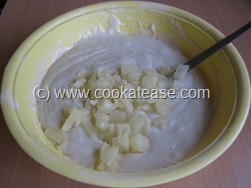 Fruit arrangement in baking tray: Cream together butter, powdered jaggery and apply evenly in the bottom and sides of baking dish. 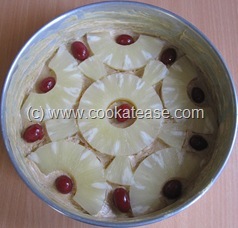 Open pineapple tin and arrange pineapple slices, cherry as shown in the picture or as you like. 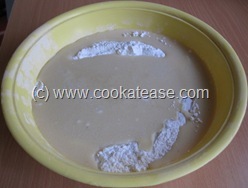 Cake mix: Sieve together all purpose flour, corn flour, baking soda, baking powder, salt and powdered sugar. Beat well butter, condensed milk, pineapple essence and mix with sieved flour-sugar mix; add chopped pineapple pieces and mix well. 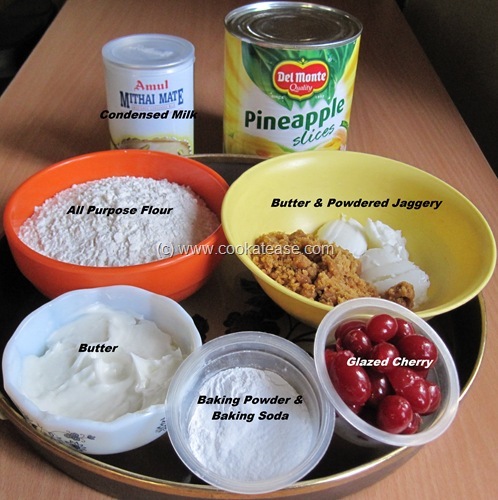 If cake mix is too dry, add 2 to 3 table spoon of water or the syrup from pineapple tin; now pour the mix in the greased and pineapple arranged tray carefully. 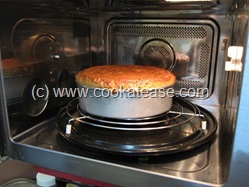 Baking: Bake at 180 degree Celsius for 40 to 45 minutes. I used my three-in-one microwave oven. Insert a tooth pick to check weather it is baked fully. 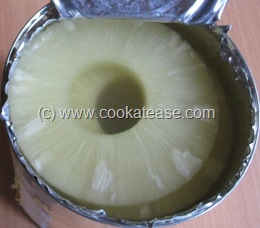 Cool well and invert the cake. 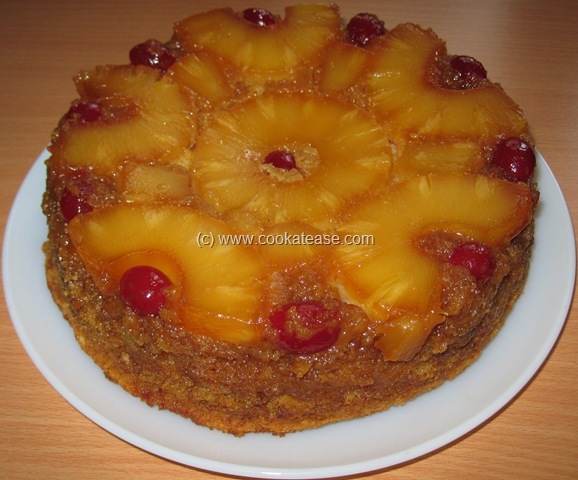 Colorful Eggless Pineapple Upside Down Cake is ready. Cut and serve. 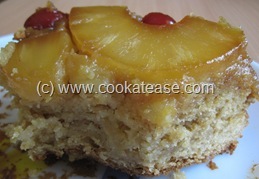 Here is the same cake in different lighting. 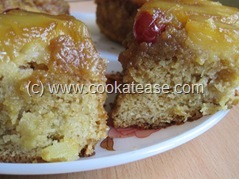 Here are the cutaway sections of the Eggless Pineapple Upside Down Cake. lovely step by step pics, i really wondered how they do this….looks too good…and so nice to see your post after a long time..
Thats a gorgeous cake, looks prefect..
Eggless pineapple upside down cake looks really good. 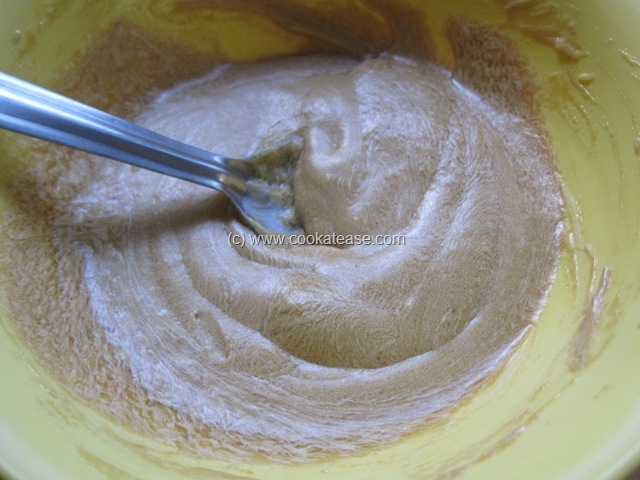 What is jaggery? Where do I get it? 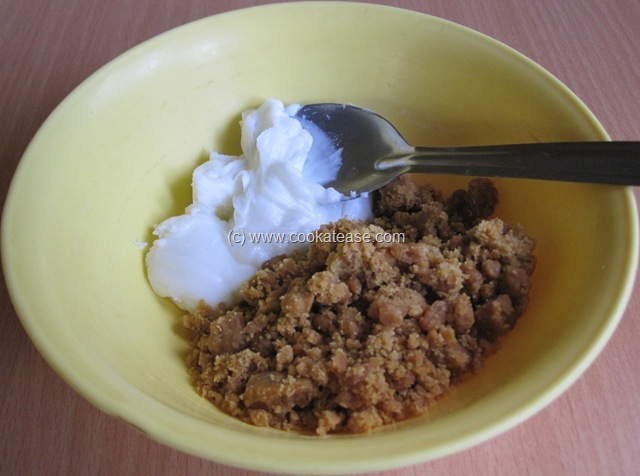 Jaggery is popular in Asia and is prepared from sugar cane juice. 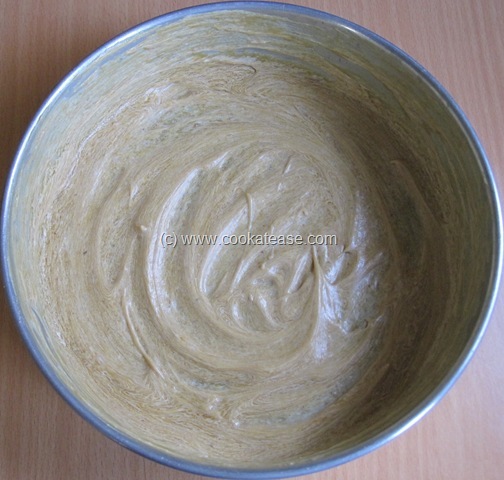 It is not bleached or chemically processed. 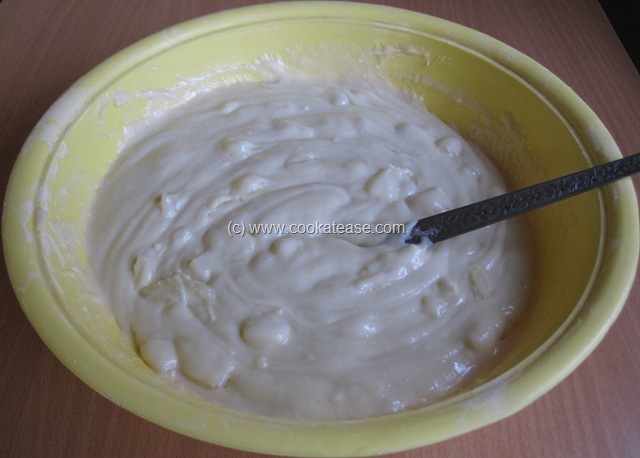 in microwave oven . which mood is suitable . waiting for your reply ??????????? it looks tempting .i want to cook for my hubby ..he’s just crazy for pineapple cakes……….. 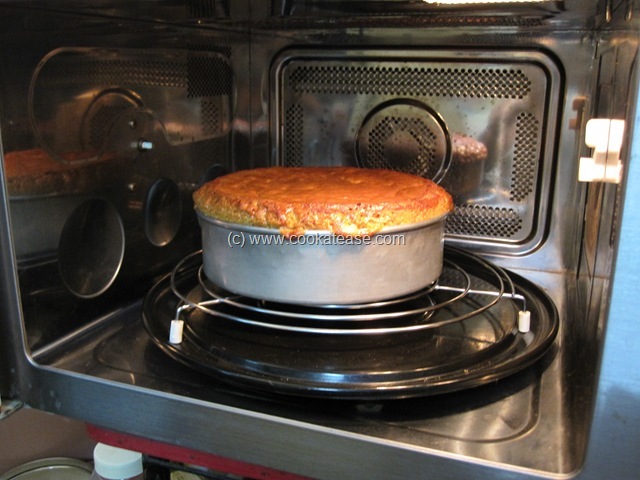 I baked this cake in ‘convection mode’ in microwave oven. I have not yet tried it in ‘microwave mode’. Refer your microwave user manual to select the suitable mode. G8! Recipe n excellent presentation……. 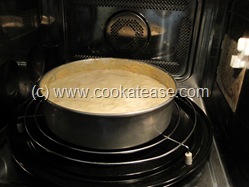 However u didn’t mention the size of the baking dish/tray (…..inches?). Kindly specify. I used a baking dish of eight inch diameter and two inch depth.